EMDR therapy can be implemented as an adjunctive therapy in agencies, taking advantage of agency strengths and minimizing weaknesses. Focus is on working effectively and purposefully to ensure best treatment for clients and less burnout for clinicians. Integrating EMDR into an “Active Ingredients” approach creates an effective and comprehensive program. This workshop is for all therapists. You do not need to be EMDR trained as this is an adjunctive model. Identify the benefits of, and the barriers to, individuals with PTSD living in poverty having access to EMDR Therapy. Access and use an evidence based intervention for building a therapeutic alliance that can improve positive outcomes and reduce client no call/no shows. Describe the “Active Ingredient” approach to effective trauma treatment. Understand the congruence between the eight phases of the EMDR Therapy model and the “Active Ingredient” therapy approach. Learn how to implement a model for EMDR Therapy as an adjunctive therapy, which reduces or eliminates the barriers to treatment experienced by indigent individuals. Cyndi Muhlbauer earned her Master of Arts Degree in Rehabilitation Counseling at the University of Nebraska at Omaha in 2002. She is a Licensed Independent Mental Health Practitioner with therapeutic specializations in treating complex trauma, trauma related issues and work/school performance enhancement. She is a Certified Trauma Professional (CTP) and a Diplomate Level Member of the American Academy of Experts in Traumatic Stress. Cyndi is a trained EMDR therapist and along with her colleague Ben Czyz, co-coordinates Lutheran Family Services statewide EMDR Therapy program. Ben Czyz earned his Master of Science in Community Counseling at the University of Nebraska at Omaha 2004. He is a Licensed Independent Mental Health Practitioner with therapeutic knowledge specialization in treating a range of mental health issues, including complex trauma. Ben has worked at Lutheran Family Services since 2004. He is a trained EMDR Therapist. 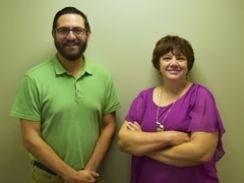 Ben and his colleague Cyndi Muhlbauer coordinate the Lutheran Family Services statewide EMDR Therapy Program. Ben and his colleague Cyndi have published their work on providing EMDR as an adjunctive therapy at a community agency in the Journal of EMDR Practice and Research, along with presenting their work at the National EMDRIA Conference.